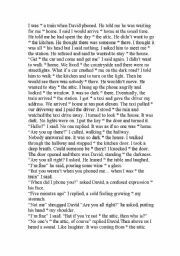 A ghost story with at, in, out, to, on and into missing. Preposition practice. 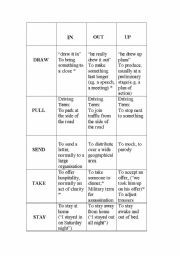 A table with SOME meanings of some oft used phrasal verbs, e.g. get in, set up etc. The table is accompanied with some practice examples. Please note: some of these verbs have further meanings. I have only used the ones I feel are the most common. 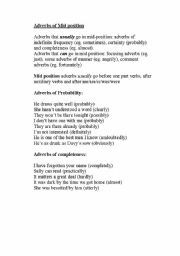 An explanation of "mid position" and where various types of adverbs belong with a few rudimentary practice examples. 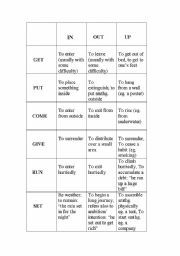 Phrasal Verb Table with excercise. The questions have been designed so that there�ll be no need to have to explain the "Verb splitting" behaviour of some, such as take in or draw up in order to successfully complete the questions. An online excercise based around Rutger Hauer�s final speech in the classic film "Blade Runner". 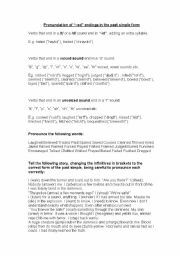 Introduces some advanced vocabulary (eg. cult following) but is generally aimed at an upper intermediate level. Suitable for teenagers to adults.